The Enounter of Our Lord, God & Savior, Jesus Christ, with Simeon & Anna. Do not let anyone think the less of thee for thy youthfulness; make thyself a model of speech and behaviour for the faithful, all love, all faith, all purity....A special grace has been entrusted to thee; prophecy awarded it, and the imposition of the presbyters’ hands went with it; do not let it suffer from neglect. (1 Tim. 4:12&14). Those particular verses are always in my mind because a portion of them are engraved on the back of the priest's pectoral cross I'm wearing today. I have several pectoral crosses that have been given to me over the years, but there are only two that I wear routinely: my "Sunday cross" is fancier than this; it's a relatively cheap replica of a 14th Century Russian cross that looks very impressive; but, the simple silver cross I'm wearing today, which I call my “weekday cross,” is actually more valuable. It's a pure silver cross given to me when I first entered the Ruthenian Church. Most of our priests have a cross just like it, but they have only replicas; this one is one of the originals on which everyone else's replica is based. 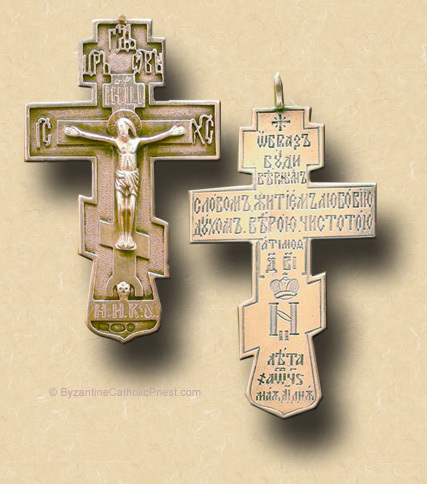 It's one of a set of crosses that Czar Nicholas II had made; and, whenever a priest would provide the service of offering the Divine Liturgy for him and his family in the palace chapel in Saint Petersburg, he would present the priest with one of these crosses as a token of gratitude. 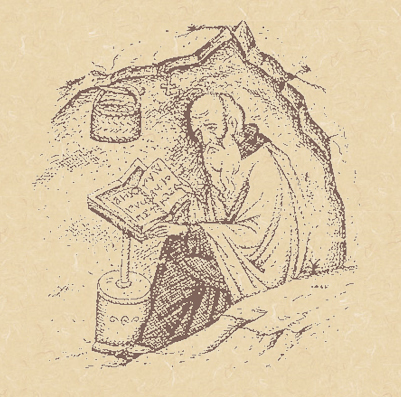 The inscription is in Slavonic; and, even though I'm long past having to worry about anyone thinking less of me for my youthfulness, I still offer a silent prayer whenever I put it on that I may be a model of speech and behavior, of love and faith and purity. Sometimes I am and sometimes I'm not, but that's true of every priest. And since Paul says those things in today's reading, that's why I chose to wear it today. I'll take a picture of it for you and post it along with the homily later today. Today is also the feast of the Encounter, as we call it. The Latins call it the Presentation. Our observance of it focuses not so much on the Lord being brought into the Temple, but on whom he meets there. The prophecies of Simeon and Anna, both recognizing the Christ Child as God, remind us of our need to constantly be on the watch for the manifestations of Christ among us—among our friends, our families, our trials and tribulations, and all the circumstances we have every day to encounter our Lord in places where we least expect him. 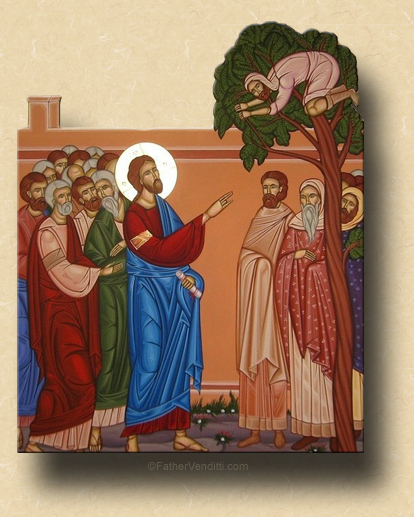 But it's been a couple of years since the calendar offered us the opportunity to celebrate the Sunday of Zacchaeus, as this Sunday before the Triodion is called. It's called that because the Gospel lesson from St. Luke—the first Gospel sung today—is the episode of our Lord's meeting with the man after whom it's named. We always celebrate the four Sundays of the Triodion itself just prior the Great Fast, but the Sunday of Zacchaeus is only celebrated when the date of Pascha is late enough to allow for it, and this year it is. I didn't preach on the Gospel last week since we were focused on Paul and Timothy; but, if you were listening, I'm sure you'll remember it: our Lord is on his way to Jericho when he encounters the blind man, Bartimaeus, sitting along the side of the road begging, and our Lord cures him. 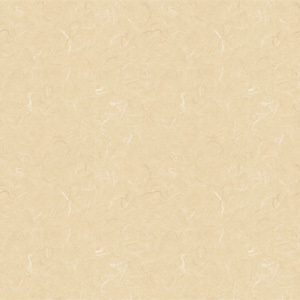 Today, he's arrived in the city; and, the meeting between our Lord and Zacchaeus is painted very vividly by St. Luke. As in the previous verses, Jesus is simply passing by, and a large number of people have lined the street to catch a glimpse of him. Zacchaeus would like to get a look at Jesus, too; but he’s at the back of the crowd and can’t see anything because, as the Gospel says, he was a relatively short man. So, to get a better look at Jesus, he climbs up a sycamore tree. One of the Fathers of the Church goes off about the significance of it being a sycamore tree; if you don't mind, I'll skip that bit. But climbing up a tree not only allows him to see Jesus, it allows Jesus to see him. Why our Lord singles him out will always be a mystery—I like to think that Jesus saw both an opportunity to save a soul as well as make a point. He is, after all, God, and certainly could know, simply by looking at Zacchaeus, exactly what kind of man he was. He also knows that, by inviting himself to Zacchaeus’ house, he’s going to be raising some eyebrows. St. Luke tells us how they all murmured when they saw the two go off together, and whispered to themselves, “He has gone in to lodge...with one who is a sinner” (Luke 19:7). Our Lord does not respond to them on this occasion. Later on, when a similar situation presented itself, and our Lord was actually seen dining in the house of a public sinner, he would utter those famous words that would forever be a motto for his ministry: “It is not those who are in health that have need of the physician, it is those who are sick” (Matt. 9:12); but, on this occasion he doesn’t say anything; he just goes with Zacchaeus to his house, and his kindness to Zacchaeus was enough to motivate Zacchaeus to completely change his life. In fact, not only does Zacchaeus change his thieving ways then and there, he also promises our Lord that he’ll pay back everything he’s stolen four times over, and give half of what's left to the poor. Now, that’s bound to make a dent in his standard of living. Zacchaeus made himself rich by stealing people’s tax money; if he pays it back multiplied by four, he’s going end up a poor man. But, apparently, that’s O.K. with Zacchaeus. The kindness that our Lord showed him by simply acknowledging him as a human being, and going to visit with him in his home regardless of how much it scandalized the self-righteous, meant more to Zacchaeus than anything else he had. Next Sunday begins the Triodion: that four week period that prepares us for the rigors of the Great Fast. With all that we have to worry about day after day, the little things often escape our attention. As we begin to prepare ourselves for Lent, perhaps it would be to our advantage to think, now and again, of all those little things that can come between ourselves and Christ, and all the little things we can do to make up for them.